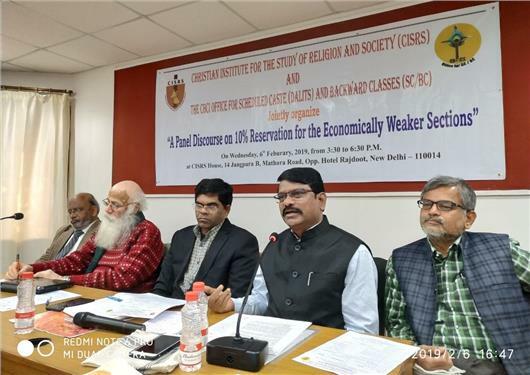 A Panel Discussion on 10% reservation for the economically weaker sections was jointly organised by Catholic Bishops’ Conference of India (CBCI) Office for Scheduled Castes and Backward Classes and Christian Institute for the Study on Religion and Society (CISRS) on 6th February 2019 at CISRS, New Delhi. Dr. Vincent Rajkumar in his introduction shared that we should work for the democratic values of the country. Dr. George Mathew in his key note address appealed that we should instil in the consciousness of the people the democratic values. Sr. Robancy moderated the first session. Mr. Aariz Mohammed, Dr. Ramesh Nathan, Prof. Arun Kumar, Dr. M.P Raju and Fr. Bosco spoke in the panel. It is noted that the 10% reservation may also pave way to the abolition of whole reservation system in India which is against social justice. We should go for caste census to implement the reservation based on social justice. The reservation is given as the retributive justice, that is to right the wrong that was done to the Dalits and Backward classes for the past many centuries. Reservation is not for the upliftment of a community but rather to ensure the representation of the communities in the Governance. In the economic policy, our country follows the trickledown theory instead of following bottom up theory as proposes by Gandhi. The Government should concentrate on Education and health, keeping in mind the saying of Gandhi, that the last should be the first. The 10 % reservation to the economically weaker sections is to conceal the failure of economic policy of successive Governments. The main reason is that we lack the Constitutional Morality. The manuvadi forces are trying to demolish the Constitution of India which is based on Fraternity and justice which ensures human dignity. The Dalit Christians and Dalit Muslims though are living in socio educational backwardness and experience the stigma of untouchability are denied Scheduled Caste status thus denying justice to them. Fr. Devasagayaraj moderated the panel. The participants resolved that they should make sure that people exercise their democratic rights by going for voting and voting to the right persons. Rev. Arvind Peter thanked the participants and the resource persons.